Today and/or tomorrow there will be many people on the highway to the beaches, various parks around the nation. Some will just grill to their heart’s content in the backyard. This is the way Memorial Day is celebrated in this nation. And that’s as it should be. It should be a celebration for the freedom to do these things as we wish. But, we should not forget what the true meaning of Memorial Day is all about. It is the farmers and merchants charging up Bunker Hill to fight the greatest army in the world all in the name of freedom. Think of Teddy Roosevelt charging up San Juan Hill facing withering fire as you sit back in your lawn chair today. 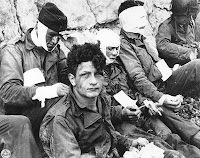 Or the first wave of men at Omaha Beach at Normandy. As you pop the tab on another Bud and woof down that pork chop, think about those men facing overwhelming odds at Pork Chop Hill. Or Hamburger Hill. When you are just sitting back relaxing and thinking about having Monday off to further the weekend, think about the men and women at Fallujah in November of 2003. As has been often stated, freedom is not free. 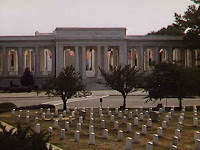 There is a cost and America’s cemeteries are littered with the remains of soldiers who made the ultimate sacrifice. From the Revolutionary War to the Iraq War, in one form or another, for one reason or another, men and women are making the ultimate sacrifice. It doesn’t matter what you may or may not think of our reasons for going to war. I was spit on and called a baby killer upon returning home at LAX in 1971 from injuries received for riverboat (or swift boat) patrol in Danang Province. But, that doesn’t matter. None of the protests, flag burning matters. What matters are these troops who have and are presently serving our country. They matter. They deserve our support, regardless of the reasons they fight. I intend to sit back and eat the steak grilled on my BBQ grill today. I might even drink a couple of glasses of wine. Ralph will get a workout in the backyard today when I throw him the Frisbee (hoping he will return it to me). I’m going to enjoy today and tomorrow also. But, as I sit back and watch people eat, drink and be merry, I’m going to remember why they can do all these things. We can celebrate in this manner because it was paid for by men and women from Bunker Hill to Hamburger Hill to Fallujah. Let’s not forget those people who we should be memorializing on this day. That’s my point. I hope everyone has a great Memorial Day weekend. I know I am. Great post, David. I agree that we should celebrate the memories of our brave soldiers in a happy and festive celebration. But we should never forget the sacrifices these brave soldiers gave in order for us to be able to celebrate any way we wish. I posted a similar post on my blog, but more in line with the excellent traditions at military funerals. Talk to you soon. Thanks Matt. As is my custom, I will be watching Saving Pvt. Ryan today. I will do the same on Veteran's Day. People take our freedom for granted. They have no idea how easy it would be to have it taken away. If not for those brave men and women in uniform, the Muslim fanatics would be here right now. I'll check your post out later on today. Thanks for stopping by. Tell Julie to stop by sometime when she gets a chance. Thanks for an inspiring post. can't say much more than that. WOW! Thanks again eirc! It's people like you that make blogging worth it!